With a 40 year+ heritage, Micross Components began transforming specialty electronics by creating a global company with the broadest offering of products and services in the industry and quickly became recognized as the global leading single-source supplier of specialty components designed and manufactured to the highest quality standards. Over the years, Micross Components acquired the specialized knowledge of these regional industry leaders into a single global marketplace for integrated circuits of all types and interconnect options. And today, Micross continues to serve the Aerospace, Defense, Space, Medical, Industrial markets with the most comprehensive range of hi-reliability components and services available from one source. 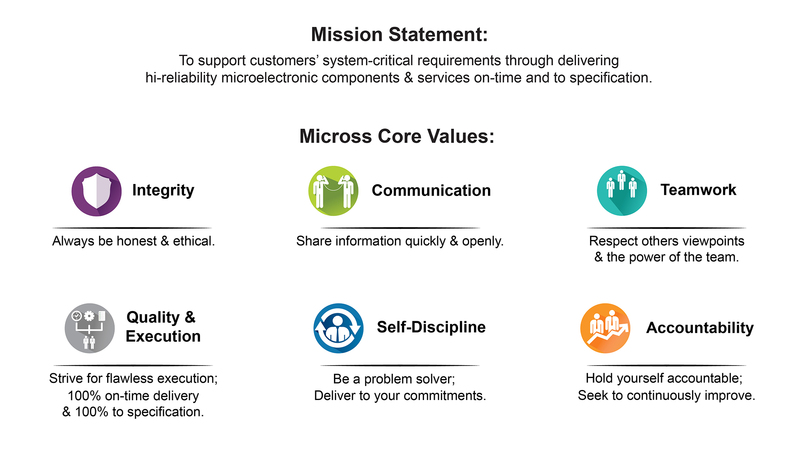 Micross' unwavering focus on our company’s Mission and Core Values differentiate us from the competition and empower our team to always deliver on customer commitments while continuing to uphold exceptional quality in everything we do.